Max Mathews is best known for his involvement in the debut of digital synthesis, but he contributed much more. His Radio Baton predicted gestural controllers that arrived much later from Nintendo, Sony, and Microsoft, and it may be his code design ideas that outlast even the memory of the computer’s first musical utterances. Photo CC-BY-NC-SA) Rainer Kohlberger. Max Mathews, the man who literally first gave voice to computer music, died yesterday at age 84. I can only offer my heartfelt condolences to Max’s friends and family. Max was the man present at the moment when the very subject matter of this site was born. An IBM 704 playing his 17-second composition marked the first genuinely digital synthesis of music on a computer. The Music 1 software demo on an IBM 704 in New York City was the first computer music performance. While not real-time, and while Mathews himself says “the timbres and notes were not inspiring,” it was a stunning proof of concept. Mathews’ arrangement of “Daisy Bell,” for a computer-synthesized voice developed by a Bell Labs team led by John Kelly, was the first “singing” digital computer. The event found its way into pop culture via Kubrick’s 2001: A Space Odyssey. Computer tech is supposedly fleeting, but Mathews’ original work on the Music I – Music V series was the direct basis for languages like Csound and Cmix, used today. (Csound apparently even found its way onto a popular karaoke machine.) The basic notions of scores and instruments, the fundamental assumptions of the language, and the essential designed features all remain visible in today’s languages. Mathews indirectly influenced every other music language since. He is the namesake of Miller Puckette’s “Max,” a reference to the timing techniques used in what is now Max/MSP, which were modeled on techniques designed by Mathews. That means that there’s something of Max’s thinking in Max/MSP, Jitter, Pd, GEM, Max for Live, and others. Before the Wii remote and Microsoft Kinect would come to change popular ideas about gestural control of computers, Mathews’ Radio Baton explored similar spatial manipulation in musical performance. 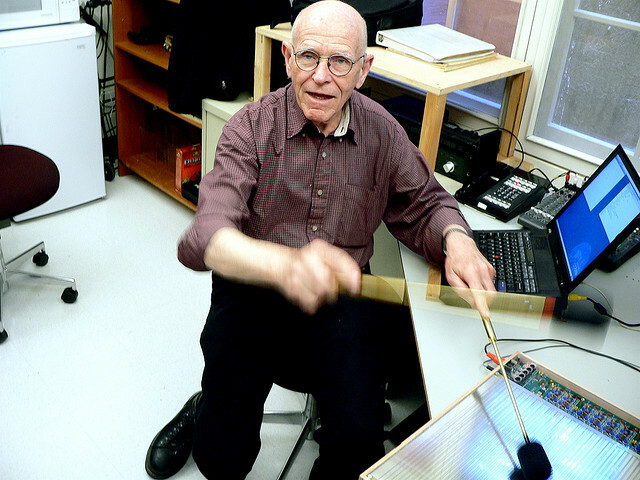 Add to that involvement with research and events like the “New interfaces for musical expression” conference, and Max has had a profound impact on the exploration of novel control. Max was warm, witty, and insightful in every encounter I had with him, going on to continue to inspire colleagues and students through his late years. He played a role not only in our narrowly-appreciated realm of computer music, but the history of the computer itself. There’s really too much to say; let us know if you have comments for CDM or contact us directly and I hope to put together something more detailed by next week.